Hakurei Reimu, shrine maiden of paradise. Or that's how it was supposed to be. Unsurprisingly enough, it turned out that the position of shrine maiden of the illusionary world called Gensokyo had its share of pitfalls. Not only did taking care of the shrine and the Gensokyo barrier all by herself prove to be hard work (and hard work is not something Reimu enjoys), but the young shrine maiden soon learned that pastimes of the many powerful beings in Gensokyo included spring-stealing, world-conquering, shrine-smashing and getting everybody too drunk to care about the resulting chaos. And who was expected to resolve all those 'incidents'? Talented and scarily effective when she gets serious, Reimu quickly taught all irresponsible inhabitants of Gensokyo a lesson, beating up any opposition standing in her way. Whenever everything went according to plan, she was back home in time for a calming cup of tea. The warm drink would be even more delightful if her past opponents didn't insist on coming along for a visit. 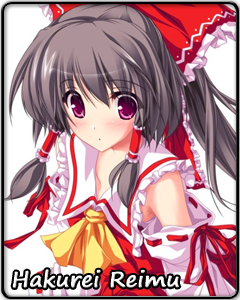 However, it appears Reimu is not destined to enjoy even the shortest time of peace. When the donation box of her shrine - the only source of her meager income, gets stolen, Reimu sets out immediately to resolve the incident for the sake of Gensokyo and her own livelihood, claiming all the while that "it's not the contents that count." And if her past record is anything to go by, she will succeed.